Are you pondering what book to read next? Ponder no more. Theresa from Pondering the Myriad Things tends to write well thought out, insightful book reviews about truly interesting green reads. That was why I asked her to be our next guest reviewer. She does not disappoint here with a powerful review of a powerful book. For some time now I’ve been concerned about food issues, both personally and globally. A lot of my new learning has taken place in this area, as I figure out how to grow and store at least some of my own food, connect with my local food producers and eat a more localized diet. I’m also struggling to eat more mindfully, in appreciation of the food I am privileged to have available to me. While I’ve been learning and doing those things, my husband Gord has been quite interested in things to do with water, and so it was he who bought and read this particular book about a year ago. It’s been sitting around the house since then, beckoning me, but it was Green Bean’s Be a Bookworm Challenge in May of this year that gave me the final motivation I needed to dive into this book at last. And now I think that water issues just might be my own personal Greenpa-esque “iceberg” to push on, since….well, you can’t have food without water. It just doesn’t get any more essential than water. 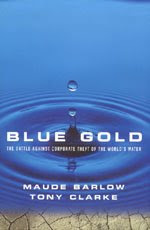 Blue Gold: The Fight to Stop the Corporate Theft of the World’s Water was published in 2002 and it is written by two Canadian authors, Maude Barlow (founder of the Blue Planet Project) and Tony Clarke (Executive Director of the Polaris Institute). It is chock full of both Canadian and international examples of the problems related to the commodification of water. The book’s main premise is that since the year 2000, when water was deemed by The Hague’s World Water Forum to be a human “need” but not a human “right,” water became just another commodity, for sale like anything else. The authors point out that the travesty of this Forum was that while it was touted to be a global government initiative, in reality it was “convened by big business lobby organizations…and the discussions focused on how companies could benefit from selling water to markets around the world (p.79).” Companies like Vivendi and Suez, the world’s biggest private water ‘service’ organizations, as well as the conglomerates of Nestle and Unilever were in attendance. The conveners of the Forum pushed hard to have water declared a need, not a right, so they could have the authority to provide water ‘services’ on a for-profit basis, to those who could pay for it. If water had been declared a human right, then governments would have been responsible for ensuring that all people, regardless of the ability to pay, would have access to clean, safe water supplies. The authors point out that, “the story of what happened at the World Water Forum is the story of the separation of water from the land and from ‘the commons’ to which it belongs (p. 80). “The book is divided into three large sections: The world’s water supply crisis, the politics of water and its sale and distribution, and some principles and ideas as to how citizens can reclaim water as part of the public commons. The Politics of Water: In the second section, the authors describe in detail how agreements like NAFTA, the upcoming FTAA and other free trade arrangements (some out in the open, some behind the scenes) have set the stage for transnational conglomerates like Vivendi, Suez, Enron and RWE-Thames to obtain government contracts to provide their citizens with ‘water services.’ These contracts have certain profit margins in them that are guaranteed by the government of the country in question – paid for by citizens’ taxes of course. Then, when the government insists that the company meets its contractual obligations (i.e., that water and sewer services be provided to all citizens, not just the ones who can afford it), the companies raise water prices to ensure their profit levels are maintained. Soon, only the rich can afford clean and safe water. The water and sewer services of many people get worse. And to add insult to injury, the water corporations are even enabled, by the free trade agreements, to sue governments of sovereign nations for impeding the free flow of commercial trade! Some governments (e.g., Bolivia), with the help of massive citizen uprisings, have been able to cancel the contracts and boot out the water company, but this hasn’t happened very often. The World Trade Organization and the World Bank and International Monetary Fund are also large contributors to the problem. These organizations have made it compulsory that countries privatize their water systems in order to comply with ‘development’ goals set as part of their international aid and debt restructuring processes. This, the second major section of the book was particularly maddening and disheartening. There was just case after case cited about how multinational corporations and agencies such as the WTO, IMF, World Bank and even the UN “serve to transfer political power from governments to corporations” (p. 175). Everything is for sale. They also talk about the destruction wreaked by international dam projects, George W. Bush’s plan for a North American Water Corridor (i.e., redirecting north-flowing water towards the south) and companies like Coke and Pepsi who are repeatedly draining the aquifers of places in the developing world in order to keep making and selling their carbonated beverages. They cite one horrifying example where a mother can’t afford enough water to drink, so she has little in the way of breast milk for her child, and the child is instead fed with Coke. 1) Water belongs to the earth and to all species. 2) Water should be left where it is wherever possible. 3) Water must be conserved for all time. 4) Polluted water must be reclaimed. 5) Water is best protected in natural watersheds. 10) Economic globalization policies are not water-sustainable. (p.
all species, to be preserved for generations to come (p. 250). I found this book to be densely packed with information — so densely packed that it took me over two months to work my way through it. The information in the book is very precise and specific, and the authors are clearly dedicated and passionate about their work. They make a powerful case for an urgent and pressing water crisis that could well take most of humanity by surprise if we don’t act soon (especially since the world is more focused on oil than on water these days). But a major drawback of the book, as I see it, is that its clarion call for change is getting buried under the overwhelming mounds of information it contains. In reading this book from cover to cover, you can’t help but sense the urgency of the problem. But because of its density, I don’t think many people will read the book all the way through unless they are specifically researching water issues or are just determined to get through it one way or the other (like anyone who is still reading this review!). Let’s just say it didn’t take long for me to clue in to why this book was in the bargain bin when Gord bought it. This is too bad, because it is an important book with a vital warning. A second drawback of the book is its lack of information on what individuals can do to change their relationship with and usage of water. This may be because the authors are focusing on more coordinated community efforts, but I was ‘thirsting’ for some information on what I could do myself right now other than just stop drinking bottled water altogether, boycotting Coke and Pepsi, and stepping up my overall water conservation efforts. On the other hand, maybe it’s up to each one of us to decide how the author’s ten principles can best be enacted in our own lives, households and bioregions. In rating this book, I’d give it a 3 out of 5 for readability, but a 5 out of 5 for comprehensiveness, and I’d recommend it for moderate or heavy duty green reading. This entry was posted on July 15, 2008 at 4:51 pm	and is filed under Uncategorized. Tagged: blue gold, corporate theft, council of canadians, depletion, issues, maude barlow, oil sands, oilsands, pollution, stop, tar sands, water. You can follow any responses to this entry through the RSS 2.0 feed. You can leave a response, or trackback from your own site. Well hey, thanks for cross posting this!